We recently had the pleasure of exploring the design for a new home with a friend who, as it happens, is an accomplished graphic designer and former San Francisco office mate. The challenge posed to us was create a simple, modern, and distinctive home redolent of the humble agrarian buildings dotting the nearby Kansas landscape, while being sensitive to the character and scale of the surrounding community. 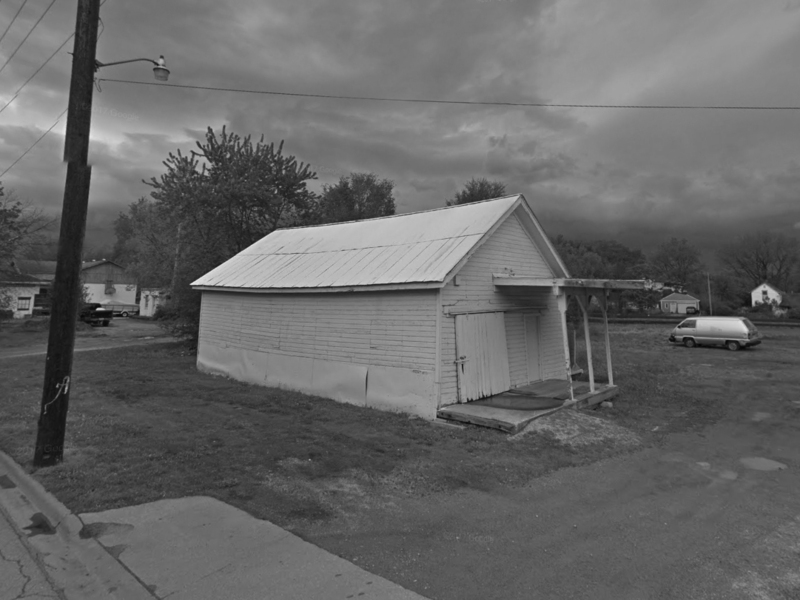 Nearby agricultural building used as precedent. 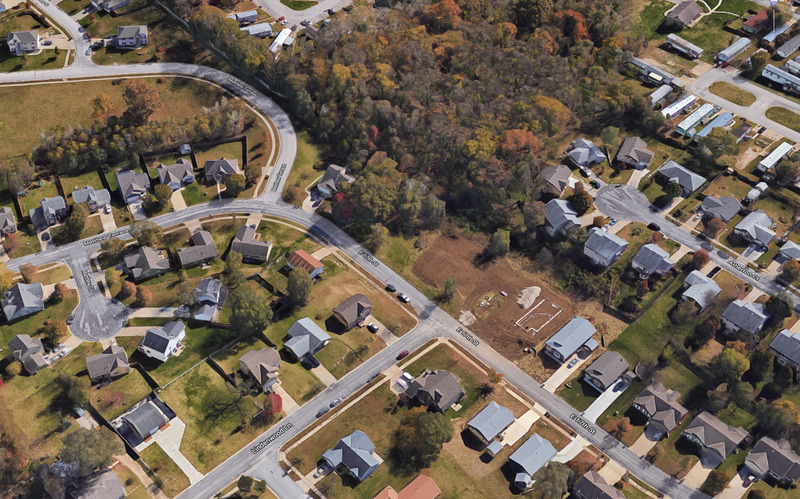 The underdeveloped lot backs up to a densely-wooded landscape. The conversation began with our friend describing her wish to create a modest but innovative and fun yet reverential house in the college town of Lawrence, Kansas. This home would serve as an escape from their hectic Bay Area lives and provide a central location for family gatherings – her sister resides less than 1 mile away and her mother in a nearby town. Additionally, they are committed to being active members of this community and intend for this home to serve as a welcome hub for their friends and neighbors supporting activities from cookouts to corn hole, bake sales to basketball, and holidays to homework. FIRST FLOOR PLAN: The carport is intended to serve both vehicle storage and covered outdoor recreation/entertaining space. 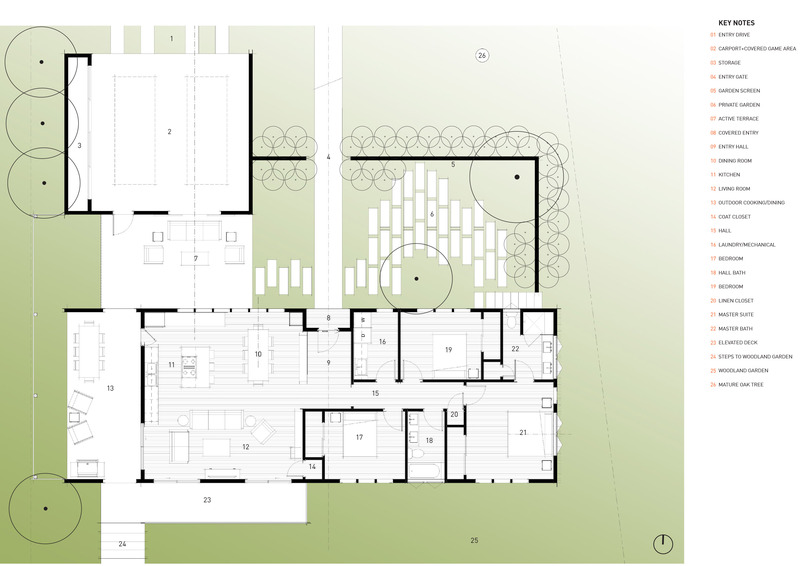 Through a series of conversations, emails, shared images, and sketches (and a little whisky) we concluded that a simple, single-story plus loft structure with an attached/detached carport both met the functional needs of the family while respecting the basic building diagram of the neighborhood – one- and two-story structures with garages in front – yet rendered in a unique fashion. In lieu of the vinyl siding, composition shingles and the humble decorative features favored by the neighboring homes, we chose a simple, durable palette of metal, wood and glass, copied almost verbatim from the farm buildings forgotten in this suburban landscape. 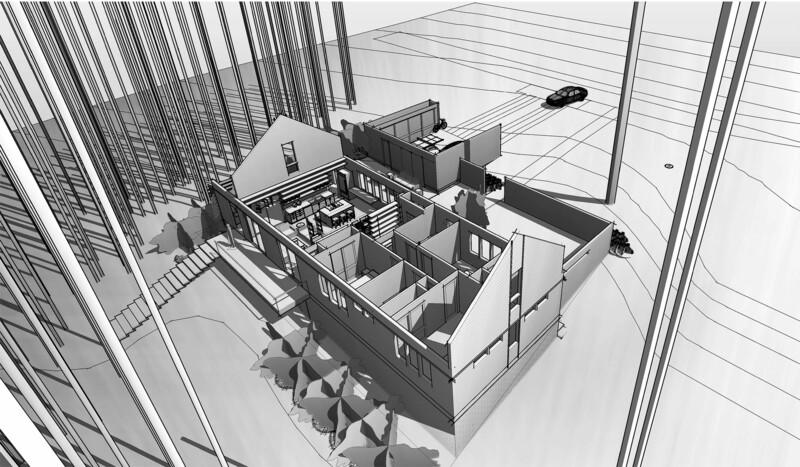 STREET ELEVATION: The resulting design is a simple extruded gable form clad in standing seam metal. This metal cladding is pulled upward between the building corners to reveal an inner layer of wood siding. CUTAWAY VIEW: Removing the roof exposes the inner functions of the home.